A few days ago, I called home during the afternoon to say hi to John and give him an update on how my day was looking. When I have a sense of when I’m coming home, I try to remember to let him know – mostly so 8pm doesn’t jump out of my file drawer and say “hey, you should probably share your plans with the other person in your home who eats dinner so he can, you know, decide whether or not to wait for you.” 8pm can be kind of judgmental, but it always has a point. So I called. And interrupted a process that will henceforth be called “baconing.” John and a friend were knee-deep (read: waist-deep) in making bacon logs. They found the recipe on the internet and have been dying to make it since. If you are interested, Google it. Okay, fine, here’s a picture. Upon arriving home, I was greeted with a weak “helloooo” from the couch. An empty bottle of Pepto lay abandoned on the kitchen counter, and a dense fug of bacon filled the air. A light dinner was most definitely in order. When I asked John if I could share this story here, he said yes, so long as I didn’t describe the bacon logs as “vile.” They aren’t vile, they taste like rainbows. Rainbows made of meat and staffed by dyspeptic leprechauns. In a recent issue of Living, I saw a recipe for shrimp burgers in pita with some sort of slaw. The patties themselves looked delicious, but I wasn’t moved by the pita or the slaw. On Erev Bacon Log, I wanted a light protein to go with a salad rather than something bready like a pita. I also wasn’t interested in the yogurt sauce Martha used to bind the shrimp mixture together. In truth, I didn’t have any appropriate yogurt – something tells me that lowfat peach chiffon would make a truly awful binding agent for shrimp. Such is often the case with off the cuff cooking; you have some, but not all, of the ingredients you’d like and going to the store will take too much time. It’s necessary to fight this pitfall with two weapons. First, it’s important to keep a well-stocked pantry and fridge at all times; watch the pantry category here for more insight into what I recommend you keep on hand. Second, it’s equally important to learn to be able to adapt what you have laying around into something you might want to eat, even if it’s not exactly what the recipe calls for. Obviously, there are times when this is a bad idea. You can’t get too frisky with anything that involves leavening, and you generally need to maintain proportions of elements (fats, acids, bases, liquids, etc.). But that leaves a lot of room for playing. So behold, the result of my tinkering. 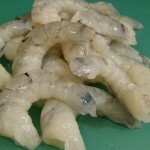 Pulse approximately 1/3 of the shrimp in a food processor until a rough paste forms. Set aside. 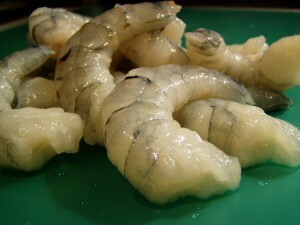 Using a chef’s knife, chop the remaining shrimp into rough chunks, approximately ½” each. Combine the chopped shrimp with the contents of the food processor in a medium bowl. Stir in the mayonnaise, buttermilk, breadcrumbs, and a light helping of salt and pepper until fully combined. Dampen your hands so the shrimp mixture won’t stick to you. Divide the mixture into four equal quadrants in the bowl, scooping out one quadrant at a time to make patties. Gently shape each patty and place on a parchment-lined cookie sheet. Press each patty down with your fingers or the back of a spoon to make them nice and even. Bake the patties for 12 minutes or until they are beginning to turn golden and any liquid around the edges has firmed up. While the patties are cooking, peel the oranges. If you want to peel them by hand, go for it. For salads, I like to make sure I’m skipping all the pith and I do it with a knife. The easy way to make this happen is to slice off each end to make two flat sides. Set it on one of them on a cutting board, and make several skinning slices with your knife as you work around the orange, following its natural shape as you go. If you are a little careful, you won’t leave much waste behind on the peel, and you’ll end up with pretty orange sides all around. 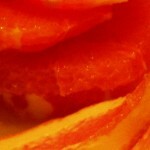 Slice your oranges into narrow disks, then into quarters and throw in a medium bowl. Add the olive oil and a generous amount of fresh ground pepper. Mix with your hands to fully coat the oranges and refrigerate. When the patties come out of the oven, use a spatula to transfer them to a plate. If you want the outsides to be a little crisp, you can gently sear them in a non-stick pan over medium heat. While they cool slightly, wash, dry, and chop the romaine. I like mine quite thin, but go with what feels good. An easy way to get lovely, uniform ribbons from your leaves is to stack them all on top of each other, then roll up lengthwise. Holding the roll steady with one hand, use your chef’s knife to cut even ribbons perpendicular to the length of the roll. Add the romaine, avocado, and spring onion to the orange salad and gently mix with your hands to fully dress the new elements. 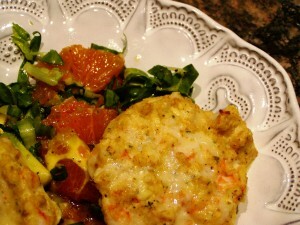 Portion between two plates (I use shallow pasta bowls for a dish like this) and top with your shrimp patties. Enjoy with a pale, hoppy beer or crisp white wine. Note – this year has been incredible for oranges in California. We are inundated with the most wonderful, sweet, ruby-fleshed orbs. 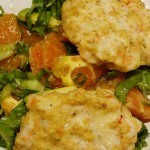 For this recipe, however, I wanted a little more snap to the citrus taste, so I added a squeeze of lemon to the salad before chilling the oranges. 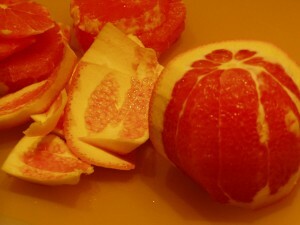 If you are using really sweet, really red oranges, I suggest you gig it a little with some stronger acid. In a pinch, a little white wine vinegar will work. You could also try the salad with grapefruit in place of oranges, but know that the stronger taste will compete a bit more with the shrimp. 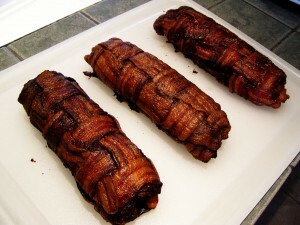 Anything cooked in a woven mat of bacon is awesome, dyspeptic leprechauns notwithstanding. The Salty Spoon is powered by	WordPress 2.7 and delivered to you in 0.243 seconds using 24 queries.